At long last Illinois is considering legislation to deal with its disquieting lion meat problem. Oh, you weren't aware that folks in Illinois were tearing into huge lion rib eyes at Fourth of July barbecues, washing down the gamey taste of proud African wildcat with onomatopoetic soft drinks and A1? Then you, my poor, guileless friend, have been living a life of willful ignorance. According to NBC news, Illinois State Rep. Luis Arroyo filed and sponsored a bill in February that makes the sale of lion meat illegal in Illinois. On Thursday, the bill was assigned to Illinois's Agriculture and Conservation Committee. 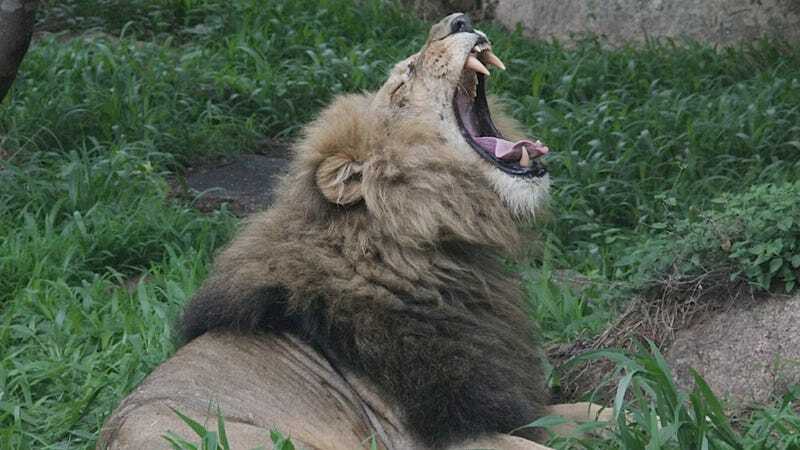 If it passes, it would make Illinois the first state in the U.S. to place a ban on lion meat. At about this time in our story, you might feel it prudent to ask yourself, "But, um, are there any lions in Illinois?" The quick answer is no, there are no lions in Illinois, but this has not stopped carnivorous Illinois from finding itself at the center of the U.S. lion meat trade. Sort of. Back in 2010, the sale of lion meat caused a minor uproar at an Arizona restaurant, which had purchased, for some unfathomable reason we can only surmise had something to do with making a lion burger in order to satisfy the armchair bloodlust of diners who've watched The Ghost and the Darkness too many times, ten pounds of lion meat from an Illinois company called Czimer's Game & Sea Foods. Since lions are not a protected species in the U.S., there aren't any explicit laws banning the sale of lion meat, which apparently has found a small market. We can probably blame this phenomenon to the lack of quality NatGeo lion documentaries circulating the airwaves right now, because if we all had to regularly watch lion cubs hide in the tall grass while their pride was being menaced by hyenas, none of us would ever eat lion burgers. We'd eat hyena burgers, obviously.